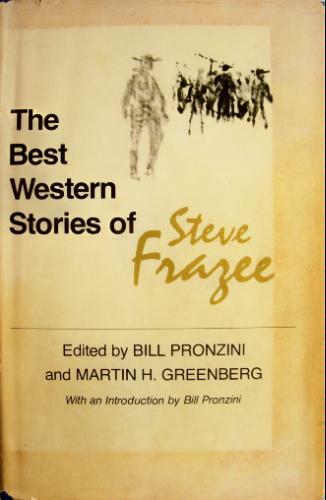 THE BEST WESTERN STORIES OF STEVE FRAZEE is the second book in the series edited by Bill Pronzini and Martin H. Greenberg and published by the Southern Illinois University Press in 1984. Charles Stephen Frazee was born in 1909 in Colorado. He completed his education in 1937 and taught high school journalism for four years. He joined the United States Navy in 1943 and served for the remainder of the war. Building inspector for the city of Salido from ’50 to ’68. he also served as president of the Salida Building and Loan Association from ’56 on(from Pronzini’s introduction). Throughout the fifties, his family and he lived in a log house he built himself, one patterned after the cabins of the nineteenth century. He was president of the Western Writers of America in 1954 and vice-president in ’72. The eleven stories in this volume were published during the fifties, his most productive period as a writer, where he turned out twenty novels, several became films and others making the best of lists, as well as a number of fine short stories(One here, The Bounty Killers, was adapted as an episode of Cheyenne). MY BROTHER DOWN THERE, a modern western crime story, won the annual Ellery Queen Mystery Magazine contest and was later included in the Best American Short Stories of The Year. He wrote for a number of television series as well and did a number of tie-in novels(Lassie, Zorro, Swiss Family Robinson, High Chaparral, Cheyenne, and Bonanza). These stories first appeared in such diverse publications as Argosy, Zane Grey Western Magazine, Ellery Queen’s Mystery Magazine, and even Swank. They covered a wide range from comedy to man’s battles against Mother Nature to the savagery of the human animal to the nobility of the same. Before reading this collection, I wasn’t very familiar with the author and had only read a couple of the tie-ins, an omission I intend to rectify in the future. Humor is prevalent in The Luck of Reilly, a tale of one man and his dealings with Lady Luck, and Due Process, with a town’s attempts to cope with the shooting death of a bully, get him buried, and the disposition of his “estate.” Though much more serious, The Man Who Made A Beeline has it’s funny moments as two men deal with a very small baby(sort of Two Men and a Baby). The Singing Sands(filmed as Gold of The Seven Saints) illustrates the greed of gold and the hold it can get on a man, two men. The Bretnall Feud is about two brothers that have hated and fought each other since two. Their father gets tired of it all and sends them away to not come back until they learned something. He would decide then which one would inherit the ranch and the other to be banished from the land. A woman was also involved. Great Medicine has a Blackfoot warrior as the protagonist who takes great chances to steal the medicine that makes a white trapper so strong. The Man At Gantt’s Place has a young man who finds his old father(all of forty) boring and goes out to find his way, learning some things as he grows up. The Fire Killer is of two hunts, a group of rustlers using Big Ghost Basin as a hiding place and a strange creature that kills with brute strength and leaves some of the strangest footprints anyone has ever seen. All good stories. I guess with the title Best Western Stories they would have to be. What I liked was the way Frazee painted the western settings with words that put you right there. He understands emotion and what can drive men to do the things they do. The writing is smooth(I think I use that word too often, but I don’t know how else to describe it) and keeps you well hooked. If you like tales that are more than just shoot-em-ups, not that there’s anything wrong with that(my Seinfeld reference), these are worth checking out. Damn. I almost made it through one day without adding to my Amazon cart. But I will gladly toss this in. I loved Steve Frazee’s novels. This is a must-buy! Greenberg and Pronzini have given us so many terrific anthologies, I can’t keep up. This sounds great. Nice post!